Tá tuismitheoir á lorg agam le taithí fichille chun cabhair a thabhairt i rith am fichillie gach Luan óna 2.30 - 3.30 de bharr uimhreacha arda. Tabhair d'ainm do Hilda má tá tú sásta cabhrú le do thoil. I am looking for a parent who can play chess to help with the chess every Monday from 2.30 - 3.30p.m. because of high numbers. Please give your name to Hilda if you are happy to help. Beidh bhur bpáistí ag siúl anuas go dtí an séipéal lena múinteoirí i gcómhair cleachtadh cóir / ceoil agus Cóineartú amárach an 29/04/2015 agus ar an Aoine an 01/05/2015. Your children will be walking down to the church with their teachers for choir / music and Confirmation practice tomorrow, 29/04/2015 and on Friday, 01/05/2015. Ní bheidh na griangrafanna don Leabhar Bliana á thógaint go dtí tar éis an Cóineartú. Photos for the Yearbook will not be taken tomorrow Tuesday 28/04/2015 as previously advised. We will arrange another date after the Confirmation. Beidh na páistí atá ag déanamh an Cóineartú ag siúl síos go dtí an séipéal maidin amárach 24/04/2015 agus ansin beidh gach duine i Rang 5 agus 6 ag siúl suas go dtí an páirc CLG do blitz iománaíochta. Children making their Confirmation will be walking down to the church to practice tomorrow morning 24/04/2015 and then all children in Fifth and Sixth Classes will be walking up to the GAA pitch for the hurling blitz. We have asked the children to cast on 20 stitches and to knit 20 rows. They should end up with a square that’s between 10cm and 11 cm. 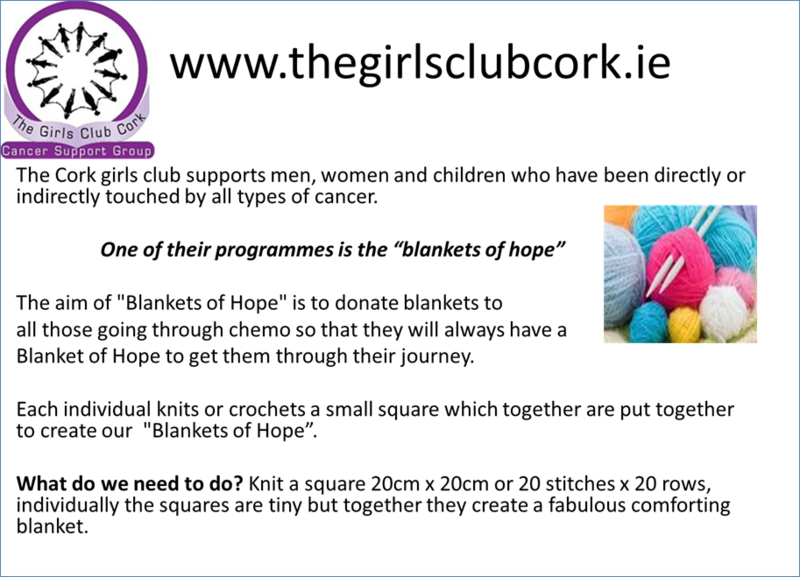 We will then join them all together to make the blankets which we will give to the charities for children undergoing chemo. The more squares the better so if you would like to dig out the knitting needles and get knitting please do and send the square in with your child to school. 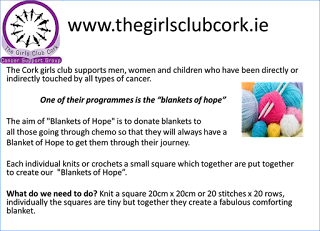 We will be back again on Friday (24.04.2015) to make further progress we hope.. please do encourage your children to bring the knitting home and do a line or 2 in the evening and also bring into school so that they can do if they have any free time. The wool shop in Kinsale has 6 sets of needles left if you haven’t got needles. Please remind you child to bring the knitting in on Friday. Tá blitz peil gaelacha ar siúl Dé Máirt 21/04/15 i bpáirc CLG Chionn tSáile i gcoinne scoileanna áitiúla do ranganna 1-3. Beidh ranganna 1+2 ag siúl ann ag a 10.00 r.n. agus ar ais ag a 12.30 i.n. Beidh rang a 3 ag siúl ann ag a 12.00 i.n. agus ar ais ag a 2.00 i.n. 1st- 3rd class have a football blitz Tuesday 21/04/15 in Kinsale GAA pitch. 1st-2nd are walking to the blitz at 10.00am and returning at 12.30 pm. 3rd class are walking to the blitz at 12pm and returning at 2.00 pm. D'éirigh go hiontach le ranganna 3+4 ag glanadh trá Bhaile an Ghearóid ar an 16/04/15. Bhailigh siad thart ar sé mála lán de bhruscar (agus crann Nollag amháin!) Ár mbuíochas leo. Tá ár gcósta ag féachaint i bhfad níos glaine anois. 3rd and 4th class were very successful with their Spring Clean on Garretstown Beach and managed to collect 6 full bags of rubbish (and one Christmas tree!) Well done to them. Thanks to them our beautiful coastline is now a lot cleaner. Saturday 18/03/2015 - Gaelscoil and Dunderrow, 6.30 p.m.
Sunday 19/03/2015 - Scoil Naomh Eltin and Summercove, 10a.m. The children and parents are asked to read pages 62 & 63 of the Thumb Book. This week also (18/03/2015) Fr. Robert mentioned that he will say the prayers before and after Communion; the children have started to learn these, so maybe let them know that they can join in on Saturday if they wish. 1. It is requested that no photographs or recordings be taken in the church before or during the ceremony; it can sometimes be too much of a distraction for the children. 2. A photographer has been booked to take a group photograph at the end of the Mass so please stay on for this if possible. Ní bheidh cispheil ar súil amarach (15.04.2015) tar éis am scoile - beidh buachaillí sciath na scol ag cleachtadh amárach. Beidh cleachtadh cispheile ag tosnú tar éis an comórtas Sciath na Scol. 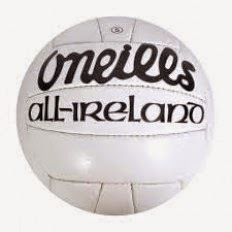 There won't be basketball training tomorrow (15th April 2015) after school - boys hurling Sciath na Scol team are training. Basketball will start after the Sciath na Scol competition. Tá rang a 3 agus a 4 ag glanadh trá Bhaile an Ghearóid an Déardaoin seo 16/04/15. Beidh costas €2 an páiste á bhailiú againn chun praghas an bhus a chlúdú. Beidh na páistí ag bailiú bruscair (beidh lámhainní ar fáil.) Ansin beidh cluichí againn ar an dtrá agus foghlaimeoimíd faoi an dtrá mar ghnáthóg agus an tabhacht a bhaineann leis an dtimpeallacht a choiméad glan. 3rd and 4th class are doing a Spring Clean on Garretstown beach this Thursday 16/04/15. We are asking 3rd and 4th class parents to give €2 per pupil to cover the price of the bus to and from the beach. We will gather rubbish (robust gloves will be provided). We will then learn about the beach as an important habitat and the importance of protecting the environment. Finally we will play some games on the beach. Fágaint na scoile: 11.30 r.n. Ar ais ar scoil: 1.45 i.n. Braitheann sé ar an aimsir!